I’m always looking for new ways to expand my love for cauliflower. One of my absolute favourite ways to eat it, is roasted with lemony tahini sauce. I also eat cauliflower as a rice replacement, in salads, pasta, stews and of course maqloubi. Recently I was inspired to create yet another fabulous cauliflower dish, that is not only super nutritious but delicious. This pasta dish combines golden crispy roasted cauliflower, garlic and kale, tossed in a creamy tahini sauce. I also love to add toasted nuts and sweet pomegranate seeds. This dish comes together quickly and is a crowd pleaser for sure. Simple, original, and perfect for these Autumn months. Prepare the lemon tahini sauce by combining all the ingredients in a small food processor. Taste for seasonings and adjust as needed. You can always add a bit more tahini if the mixture is too thin or more water if the mixture is too thick. Preheat the oven to 425F. On a sheet pan toss the cauliflower and garlic with the 3 tbsp olive oil and sprinkle with salt, pepper and crushed red pepper flakes. Bake in the oven until the cauliflower is brown all over, about 30 minutes. Toss halfway through cooking. When cool enough to handle peel the garlic cloves. Wash and chop kale, massage lightly with 1 tbsp olive oil. Bring a large pot of lightly salted water to a boil. Cook the pasta until al dente. Drain the pasta, reserving about 1/4 cup of the cooking liquid. 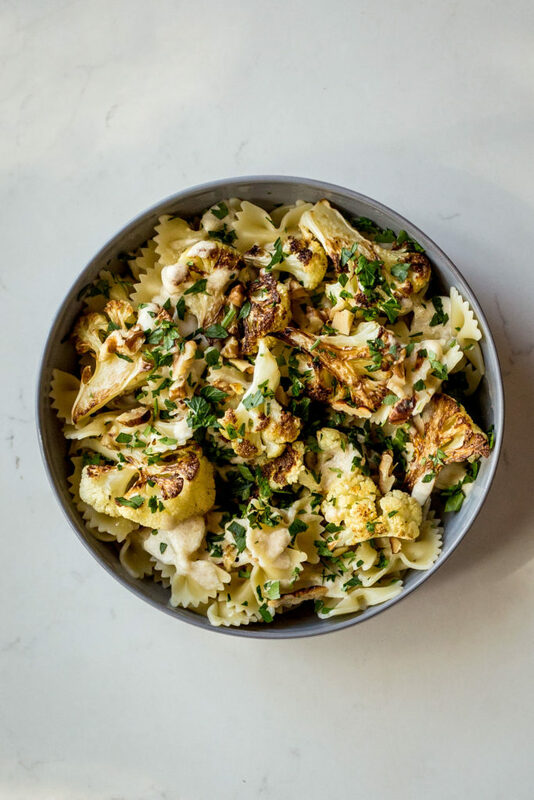 In a large bowl toss the pasta with the cauliflower, garlic and kale. Drizzle with the tahini sauce and toss until everything is evenly coated. Garnish with toasted pine nuts and pomegranate seeds.